Just because Apple’s rolled out new fancy-schmancy models of the iPod nano and iPhone doesn’t mean that your third-generation iPod nano or first-generation iPhone need be tossed in the nearest dustbin. (Incidentally—does anybody actually still use the word “dustbin?”) Here’s a pair of cases for each of those deprecated (but no less loved) models that you might be able to pick up on the cheap now that everybody’s focused on their shinier successors. Combining the flexibility of a silicone skin with a hard-plastic faceplate, the Griffin FlexScreen is a hybrid case of an increasingly popular type. The translucent silicone skin slips over the nano, with openings for the screen and Click Wheel on the front, and the headphone jack, hold switch, and dock-connector port on the bottom. A transparent hard-plastic shield, with an opening for the Click Wheel, clips onto the corners of the nano to provide more robust protection for the screen. Overall, the FlexScreen is a nice mix of convenience and protection. Raised nubs on the back of the silicone make it easy to hold onto the iPod, and the faceplate clips on securely enough that it won’t just slip off in your pocket. The Click Wheel’s only protection is that it's recessed under the silicone and plastic layers—it’s not covered by anything—but that ought to be enough for everyday use. And all of the nano’s controls are accessible, though people without long fingernails might find it a little bit of a challenge getting to the hold switch. 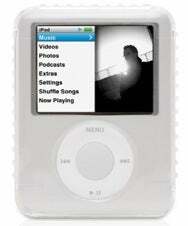 The third-generation iPod nano, like its predecessors, is a great workout accessory. And the iSkin DuoBand makes it even easier to enjoy your tunes on the run. The DuoBand is made up of two parts: the case—a silicone skin with a hard-plastic faceplate—and an armband. Like the iSkin Duo on which it's based, the case for the DuoBand is an excellent hybrid. You slip the nano into a smooth, silicone skin and then clip a hard plastic shield on the front. This version of the Duo is even easier to use—I didn’t end up having to “massage” the silicone to fit as I did with the standalone model, probably due to the way the clips are constructed. Individual openings at the bottom of the case give access to the hold switch, headphone jack, and dock-connector port. Both the headphone jack and dock-connector port have silicone flaps that serve as dust covers, though they can be more annoying than useful, especially in the case of the headphone jack: how often are you really not using the headphone jack on your iPod? The Click Wheel is accessible via an opening in both the silicone and the plastic faceplate, while the screen is well-protected, but clearly visible, through a transparent window. The armband is among the best-constructed that I’ve encountered. The holder for the Duo case is tough and fits the case snugly, so there’s no danger of the iPod sliding out. Unlike most armbands, which let you tighten on one side only, you can pull either end of the DuoBand to adjust the fit; both sides have Velcro fasteners. And, my favorite feature, iSkin even affixes a rubber pad to the back of the plastic mount, to prevent the kind of pinching that can often occur from the plastic holders on other armbands. Though the DuoBand might be one of the pricier armbands on the market, it’s also a good example of getting what you pay for. It’s well made, comfortable, and ably straddles the line between accessibility and protection. 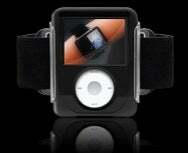 If you’re looking for a workout accessory for your 3G iPod nano, it’s hard to do better than the DuoBand. Protecting your iPhone with a silicone case is handy, but the added bulk can make it difficult to keep your iPhone in your pocket. Speck’s ToughSkin tries to bridge this gap by including a belt holster specifically designed for use with its sleeve. The ToughSkin is more robust than a lot of other silicone cases; Speck has taken special care to reinforce the corners, but one big hole—literally—is that there’s no screen protection. The ToughSkin gives you access to the Ring/Silent switch, headphone jack, and the microphone, speaker, and dock-connector port; it also covers the Sleep/Wake switch, Home switch, and the volume up/down controls with a thin layer of silicone. There are also openings for the earpiece and the camera, for using those features. The included holster has a couple of nice features. For one thing, an opening in the bottom of the holster leaves the speaker accessible, so that you can easily hear your phone ringing, and even access the dock-connector port if you want to. The belt clip is solidly constructed and rotates a full 360 degrees. Best of all, the clip locks into the open position so you can use the holster as a stand for watching video or viewing pictures. 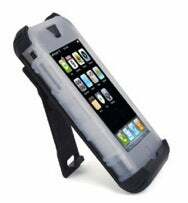 Overall, the ToughSkin is a decent if not standout case for the original iPhone. There are a lot of hardshell cases and many of them look the same: a pair of clear plastic pieces that snap together. 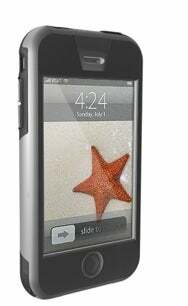 The iSkin Fuze operates on the same principle as those, but it’s a little more eye-catching than your average hardshell, with a two-tone black/silver case that echoes the design of the original iPhone. In order to offer as much protection as possible, the Fuze provides openings only where necessary: the bottom is open for access to the speaker, microphone, and dock-connector port; there’s a slit for the earpiece; the back has an opening for the camera; the top allows access to the headphone jack; and there’s an opening for the Ring/Silent switch on the side, though it's deeply recessed and hard to get at. A small silicone flap fits into the dock-connector port when it’s not in use to keep dust out. Meanwhile, the Sleep/Wake switch, volume up/down controls, and Home button are covered with rubberized nubs. That’s nice for protection, but it’s a little annoying because there’s little in the way of tactile feedback from pressing those buttons; I often felt like I ended up pushing harder than I really had to. And given the emphasis on protection, the inclusion of only an adhesive transparent film for keeping your screen safe is less robust than I'd like. As hardshell cases go, the Fuze feels nice in the hand, and it’s pretty good in the protection department. It does add a fair amount of bulk, though, and it’s pretty expensive for what it offers, but it’s a decent option.